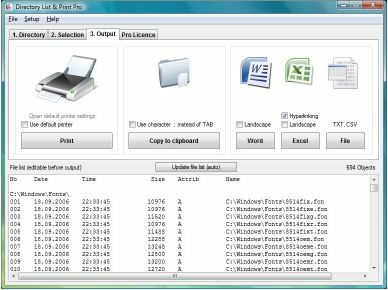 Directory List & Print is a software tool for Windows™ and enables listing and printing the content of any directory in a simplest way. By copying to the clipboard the lists can be exported into other programs or opened directly in Word™ and Excel™. The Free Version (Freeware) has all the basic features included, the Pro Version (Shareware) provides interesting additional features. Selection of directories to be listed by a tree structure. Selection of directories by entering the path as a text string. Drag & Drop of directories (or a file) from Windows Explorer. Integration of “Open in Directory List & Print" in the directory context menu of Windows Explorer. Direct selection of important system directories as “My Documents" etc. Listing of sub-directories and/or files and looping through sub-directories (recursion). Update file list automatically or manually. Display of last modification date. Display of last modificatione time. Display of file name with or without directory path. Display of file names with or without file extensions. Indication of number of entries of files and directories in the list. Print directory listing, direct printing of corresponding list. Export list into other programs by copying to the clipboard. The corresponding data will be organized in columns and separated by tabs so that the list can be pasted directly into Excel ™ as a table. Open the list directly in Microsoft Word™ and Excel™. Support for connecting and disconnecting network drives. Automatic saving of display options when exiting the program. Start program with a directory path as a parameter. Portable Application, no installation necessary. Set directory recursion depth for subdirectories. Display of file attributes such as Read Only, Hidden, System, etc. Calculate CRC32 checksums for files. Display format of audio/video and image files. Display of dimensions like width, height, bit depth or frames/s. Display duration and title of audio and video files. Display of sampling and bit rates for audio files. Display of a continuous numbering of the objects. Display of column titles in the first row. Show number and sum of size and length of the displayed objects. Display of the date in many different international formats. Set filter to include or exclude certain file types. Set filter to include or exclude files and directories by certain terms. to a new directory structure (path+filename, filename only, >, =, <). Output the list directly to the default printer. Output the list in comma- or tab-delimited file or CSV file. Linking of files and directories in Excel™ for direct open by mouse click. About 7 MB disk space.